Our product range includes a wide range of casual stylish dress, casual cotton salwar, casual cotton salwar kameez, casual silk salwar kameez, cotton casual dress and digital print salwar kameez. We are the Leading Trader,Supplier and Wholesaler of Casual Stylish Dress in Chennai,Tamilnadu,India. We are preeminent name engaged in manufacturing, supplying and exporting superb quality Casual Cotton Salwar. Our offered clothes are well acclaimed by our clients for their vibrant colors, comfort wear and shrinkage less fabric traits. With the designing and fabrication being done by dextrous professionals, these clothes are available with us in varied designs and sizes for serving huge clientele base. 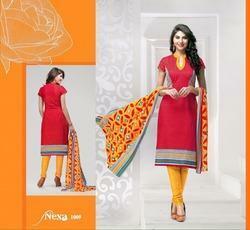 We are the Leading Trader,Supplier and Wholesaler of Casual Cotton Salwar Kameez in Chennai,Tamilnadu,India. We are the Leading Trader,Supplier and Wholesaler of Casual Silk Salwar Kameez in Chennai,Tamilnadu,India. We are the Leading Trader,Supplier and Wholesaler of Cotton Casual Dress in Chennai,Tamilnadu,India. We are the Leading Supplier,Trader,Exporter and wholesaler of Digital Print Salwar Kameez in Chennai,Tamilnadu,India. Looking for Casual Cotton Salwar ?